Google is currently beta testing a new travel app called Google Trips. The new travel app is currently being tested by members of the Google Maps Local Guides program and is reported to be ready for launch fairly soon. Google Trips will be able to showcase a list of your past and upcoming trips by cataloging relevant emails in a user’s Gmail account or by adding trips to the application manually. Once the trip is added, a range of information relating to a particular trip becomes available such as public transportation, taxi services, rental car services, local sights and also restaurant recommendations. 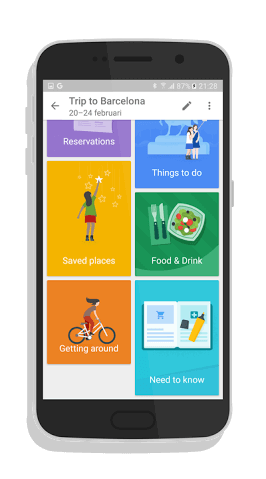 Also included in the Google Trips app is a “Things to do” section that shows attractions and popular tourist destinations related to your trip. There is already a feature similar to this in Google Maps, but the information displayed in Google Trips seem to be more robust in the amount of information provided. A useful feature for Google Trips is that it allows users to browse saved trip information even when the user is offline. The app is only available for Google’s Android OS at the moment with an iOS version to be released soon. There is no exact timeline as to when Google Trips will be released.